The exemplary 2013 puzzler Papers, Please put players in the uniform of an immigration officer tasked with checking passports and documents at the border of a fictionalized East/West Berlin in 1982. 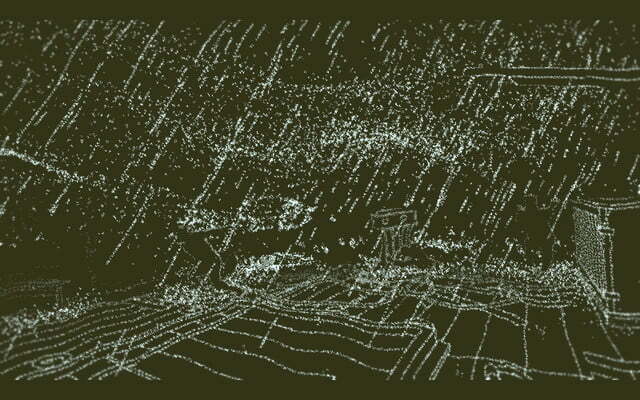 Return of the Obra Dinn rewinds the clock to 1807, placing you in the shoes of an insurance investigator searching a ship that had vanished five years prior. Both games were developed by Lucas Pope, a man who has a startling knack for turning the perceivably mundane into something extraordinary. 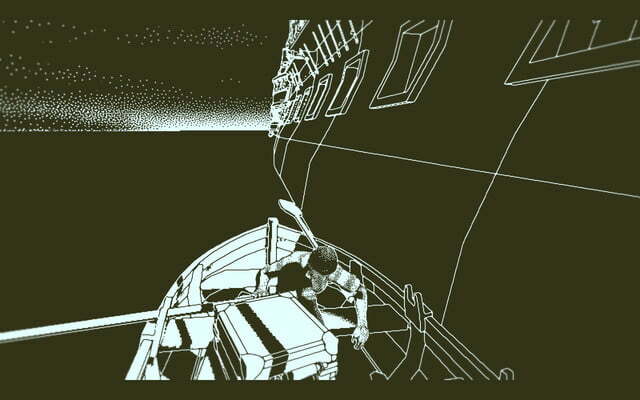 Return of the Obra Dinn, like Papers, Please before it, is unlike anything you’ve ever played. Pope’s latest experiment with style and form is devilishly brilliant and one of the most compelling indie games I’ve ever played. The Obra Dinn, a merchant ship, left a port in London in 1802. 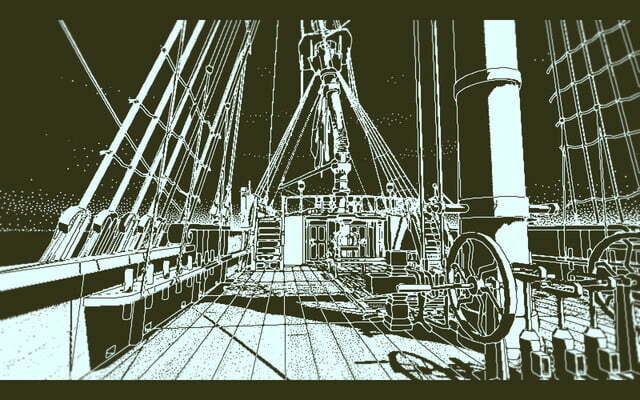 Helmed by Captain R. Witterel, the Obra Dinn had a total of 60 people aboard. By 1803, the ship still hadn’t arrived at its destination. Though declared lost at sea, the Obra Dinn mysteriously showed up at a port in Falmouth in 1807, close to five years after it departed. This is the tantalizing setup for Return of the Obra Dinn, and if it sounds like a huge conspiracy theory, there’s a rhyme and reason to what happened to the ship. That is, if you are willing to exercise the patience needed to unfurl this epic mystery. As an insurance investigator, your job is to study the ship, which is intact but with tattered sails and decayed-to-bone bodies strewn across its decks. 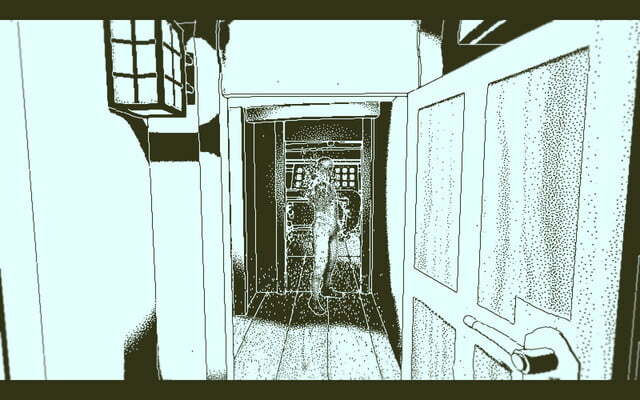 The first thing you’ll notice about Return of the Obra Dinn is its visuals. 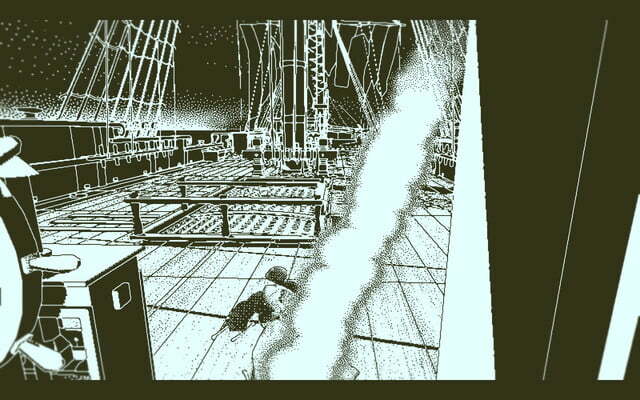 Pope emulated old-school Macintosh 1-bit graphics, so everything is depicted in shades of grainy black and white. It’s an interesting choice, for sure, and it takes a little time to get used to. But the dedication to this aesthetic creates a beautiful, captivating experience. Armed with a magical pocket watch, you enter into a memory that showcases the moments before the death of the body before you. Playing from a first-person perspective, you board the boat by yourself and immediately find a single corpse on the deck. Armed with a magical pocket watch, you can enter into a memory that showcases the moments before the death of the body before you. These scenes typically start with a black screen and brief bits of dialogue. 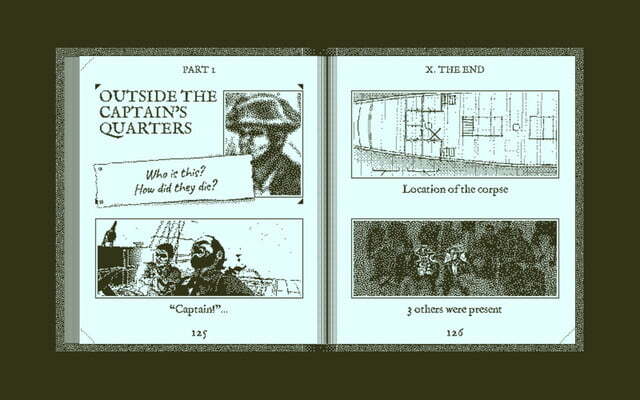 Then you have a short period of time to survey the scene, to examine the frozen-in-time crew members. Each memory and person you examine is added to your log book. 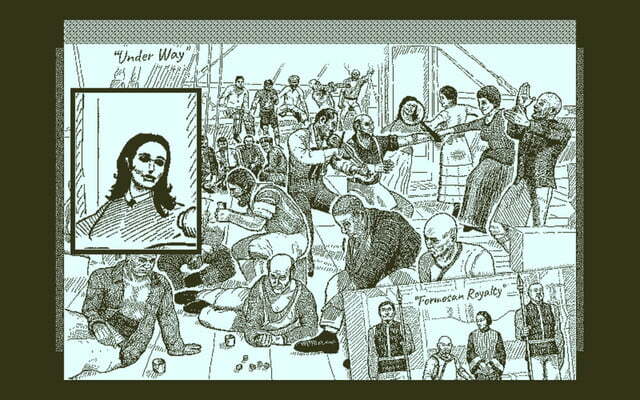 The overall goal of Return of the Obra Dinn is to identify all 60 crew members by name, cause of death, and what/who killed them. 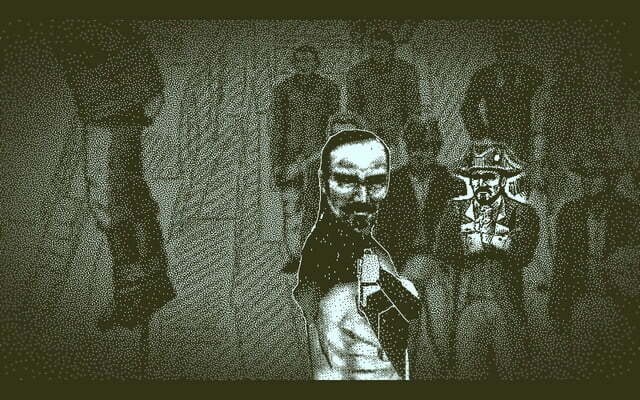 To be quite honest, I was very overwhelmed when I started playing Obra Dinn. Out of the gate, you have a ship manifest, a crew photo, and a couple of supplemental documents, but the task at hand seems virtually impossible. First of all, it’s very rare for a name to be outright given to you. And it’s also a stroke of luck if you can identify a crew member the first time you encounter them. Instead, you’ll have to build your case by carefully paying attention to dialects, what people are doing, and who they are spending their time with, to make educated assumptions as to who they are. Your notebook thankfully tells you when you correctly identify people — but only in groups of three. To make matters even more complicated, you won’t see the events in chronological order. In fact, some of the very first scenes I saw happened at the end of the timeline. 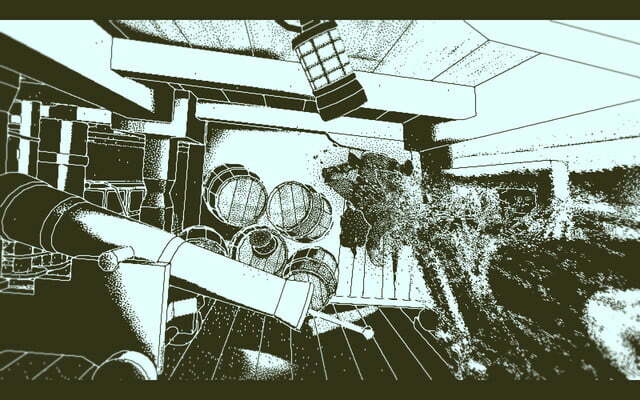 If you’re hoping for a neat and tidy experience, Return of the Obra Dinn doesn’t allow that. I found myself taking pen and paper notes to mark little details that I thought could be relevant. It’s a testament to its remarkable design that this initially “impossible” experience is actually very doable. Not since The Witness have I felt such pride in coming to the correct conclusions. And just as I did with The Witness, I found myself taking pen and paper notes to mark little details that I thought could be relevant. 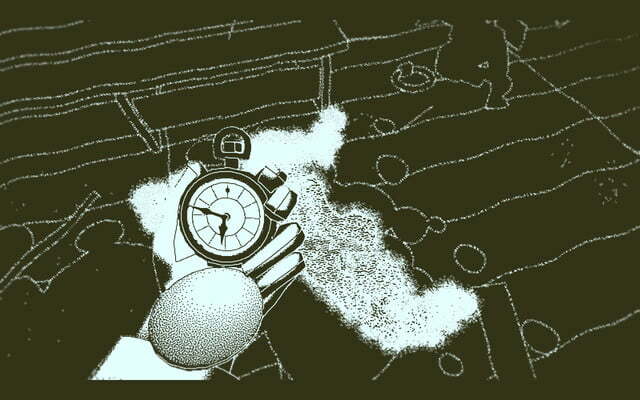 On top of being a truly stellar logic puzzle game, Return of the Obra Dinn spins a great yarn. Talking too much about this crew’s last voyage would spoil its key moments, but just know that this crew saw a lot of things, and you’ll be glad to be on the Obra Dinn after the fact. The story playing out non-linearly only heightens the intrigue. There were times when I witnessed something very peculiar only to understand it in a different light some time later once I saw the backstory. Despite only getting to know its ensemble cast during the moments leading to their deaths, these characters come to life all the same. 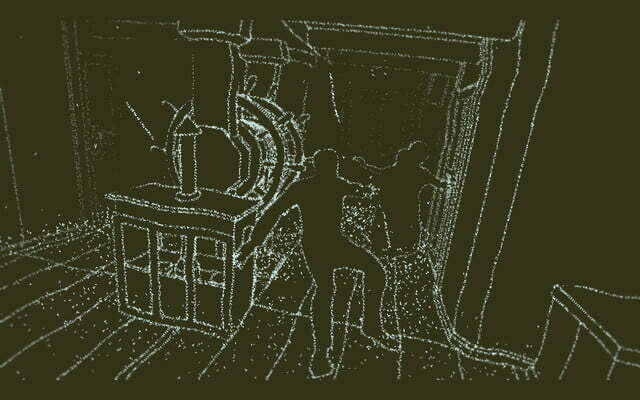 While you can actually complete the game without identifying a single person, Return of the Obra Dinn rewards those who take on its arduous task. 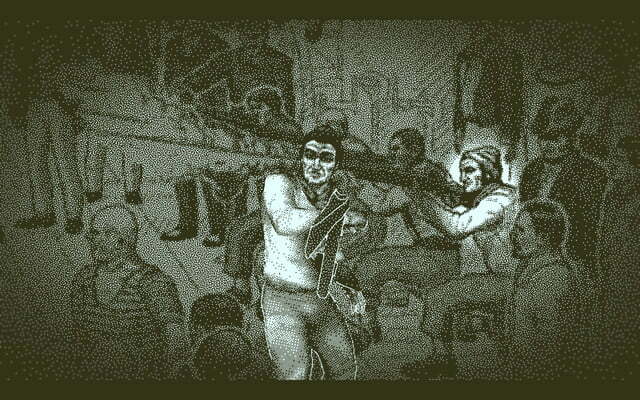 Like Papers, Please, Return of the Obra Dinn cannot be constrained to one genre. Yes, it’s sort of like a walking simulator. It’s also a mystery game. And, of course, it’s one big logic puzzle. At the end of the day, though, I’d recommend it to anyone who’s craving an experience that leaves you in awe.